For those who have recently been fitted with a new pair of hearing aids, welcome to a world with clear, crisp sounds. You’ll now be able to keep up with conversations with friends and loved ones, engage in all the activities you love, and feel more connected to the world around you. Hearing devices, the most common treatment for hearing loss, bring invaluable benefits to not only your hearing ability, but to many other aspects of your life. Studies have shown that it takes people an average of seven years before seeking treatment for hearing loss. Throughout the years with untreated hearing loss, your brain may have adjusted to hearing muffled or distorted sounds, so adjusting to your new hearing aids may take some effort and patience. 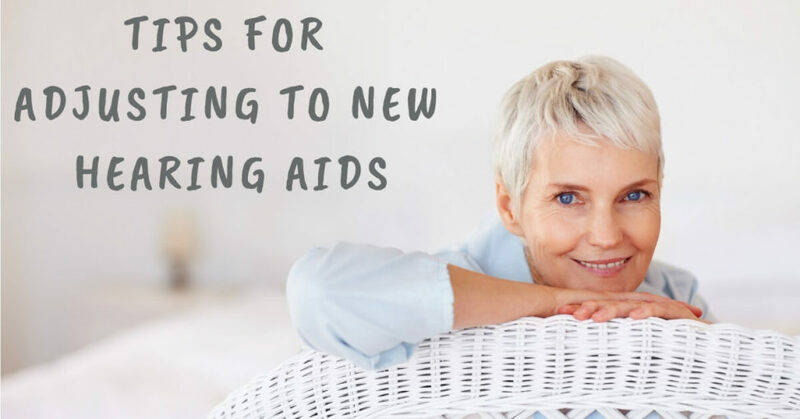 We’ve compiled some tips for you to adjust to your new pair of hearing aids. Over the years, your brain has adjusted to the strain of hearing, picking up distorted sounds and speech. For this reason, it’s important to know that your brain needs time to adjust to hearing properly again. Upon getting fitted with a hearing aid, sounds may seem much louder than they previously were, but it is crucial to not make too many adjustments to the volume. It’ll take some time for you to readjust to hearing clearly again. Equally important is to relearn sounds in various settings. As sounds may be much more amplified upon a hearing device fitting, starting off in a quiet place is helpful. Get used to the sounds around your house first before moving to more noisy environments. As the adjustment period takes time, the process of hearing clearly may be tiring, so it’s okay to give yourself breaks to avoid cognitive fatigue. Taking breaks from wearing and using your hearing aid is fine, but be sure to commit to consistently use them every single day. Hearing devices are meant utilized throughout the day and taken out at night before bed. As it already takes much time to readjust to hearing aids, wearing one inconsistently only prolongs the process and fails to utilize the hearing instrument’s full benefits. The more consistently you wear your hearing device, the more normalized your hearing will eventually become. Certain sounds may sound odd at first, but there are ways to get used to your hearing aids. Reading aloud to yourself or to your children or grandchildren will help familiarize yourself with your own voice. You can also captions or subtitles while watching TV or a film to guide you along with the audio. As you become more comfortable, move beyond the confines of your own home and utilize your new hearing device in everyday outside settings. Hearing aid fitting generally refers to the physical feel of the hearing aids on your ears, but also point to the performance and effectiveness of them as well. When you are fitted with a new hearing device, there may be an ongoing process of fitting, both the physical feel and the performance. You may feel that the hearing aid does sit well in or on the ear, depending on the device you have. Likewise, the sounds being amplified and processed may not be as clear and crisp as you may expect. In the first few weeks or months of utilization, make sure to jot down notes when it comes to comfort and effectiveness to report back to your hearing health professional. In those years of untreated hearing loss, you may have missed a lot of conversations. But with the fitting of a new hearing device, you once again will be able to fully connect with those around you. Although there may be an adjustment period at first, the more your practice conversing with use of your hearing device, the better you’ll become. Start off with a one-on-one conversation with family first and scale up to a conversation with a group of friends. During these moments, you’ll have the opportunity to learn about how your hearing aid’s features and options work, and allows you experience to make adjustments your listening experience. Adjusting to your newly fitted hearing device takes time, and it’s an ongoing process with fitting and function. If you commit to wearing your hearing device each day, every day, and practice with loved ones and friends, you’ll find them to be an indispensable part of your life. All Ear Doctors is here to help you with your adjustment process – reach out to us for support!